We sent our Amanzi detectives to check out two of Bucketlist’s water-based adventures packages. Bucketlist is a Cape Town based adventure business. The team members are local and lekker – the Bucketlist team is genuinely passionate about their water-job and delivering the best quality service. 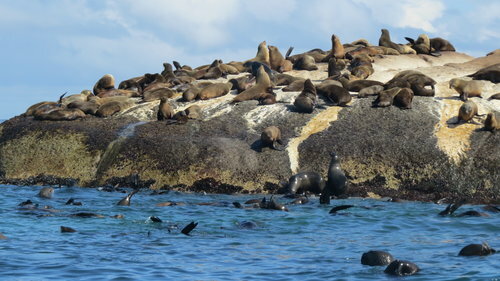 Then, as the temperature rose towards midday, we did: SEAL SNORKELING BY SEAL ISLAND. Kayaking was our first water activity – we met by Ground Up cafe around nine in the morning. There was no wind. When kayaking in the ocean, a naturally windy ‘platform’, it is important to know the strength of the wind and the direction in which it blows. As it kayaking may not always be the best idea when things get too windy. Fetch – the distance of wind travel over open water – essentially, the wind constantly blowing in one direction over a given radius of water. The crew made the experience easy and enjoyable – from the start, they gave a little run-down of the activity, what to expect and of course safety procedures. Once that was done, they gave us each a life vest, snacks, a bottle of water and we were good to start. Images provided by Bucketlist – can you spot the Amanzi detectives? We walked to the jetty, where a bunch of kayaks waited for us. 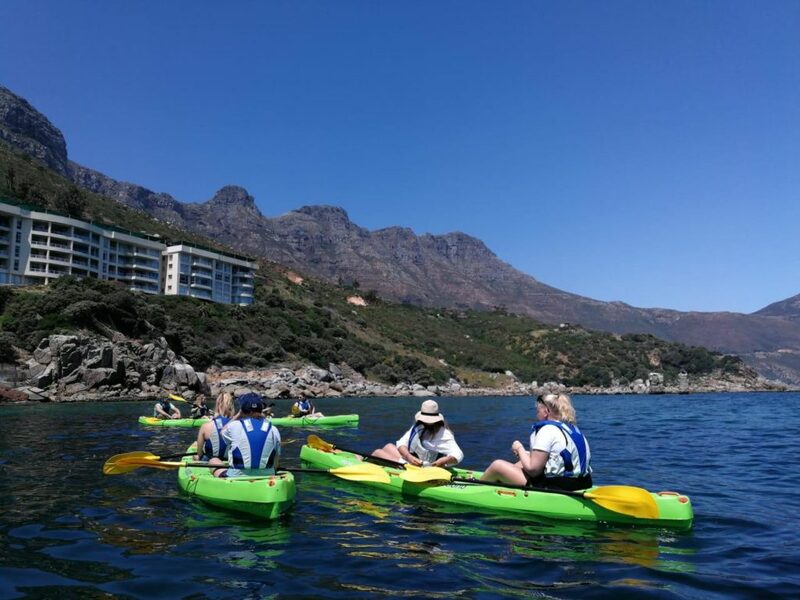 Once we positioned ourselves in the beautiful, modern and lime green kayaks, we were ready to paddle away across Houtbay’s beautiful coastal line. Our first pit stop was by the Seal Rescue and Rehabilitation Center – a marine wildlife rehabilitation center, for sick and hurt seals of all ages. There are various reasons why seals can get end up in the rescue center – but the biggest problem of all, for which we (as the general public), should and must be held accountable for is water pollution. Ranging from chemical substances to plastic waste there is just too much of it, and it keeps endangering the livelihoods of thousands of sea creatures. Garbage in our ocean not only affects seals – it affects other aquatic animals, which in turn affects the ecosystem as a whole and ultimately, humans as well. 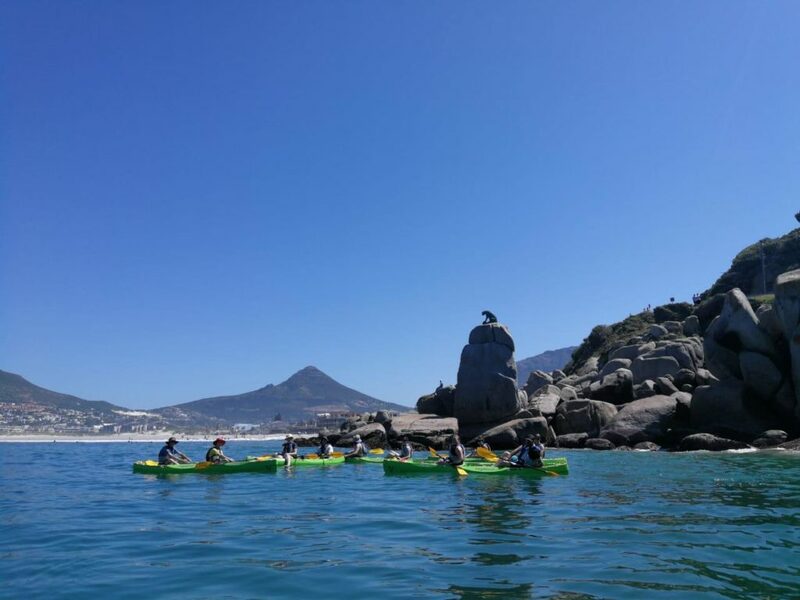 As we paddled across the bay, the guides gave us some insight about what was around us and told us some interesting stories – including narratives behind shipwrecks, old cannons and the iconic leopard statue that stands amongst the rocks, at the beginning of Chapman’s Peak road. After that, we paddled back to the harbourside and snuck in between columns under the pier. There we were surrounded by different types of mollusks, and other invertebrates like as starfish, crabs and sea snails. Out of the two experiences (whilst them being completely different) snorkeling with seals is enriching at a much more personal level. The whole excursion,is unlike anything else we had ever done – from putting on a full body ( head, hands, and feet) wet suite, to getting onto a boat with the intention of jumping off into freezing waters, by a rock inhabited by over 15000 cape seals, and a gigantic Elephant seal (an alien seal species, originating from Antartica). The trip began around 11:00 am at the Boat Yard, just behind the Atlantic Boat Club. Before getting into the water, they asked us a few questions in order to grasp an idea of what our experiences and concerns were. The space they created also allowed us to comfortably ask all types of odd, relevant and irrelevant questions – which is always nice. After that, we zipped up our wetsuits and got into the boat. After about 10 minutes, we had arrived. So we adjusted our masks, snorkel and jumped in. The tranquility we experienced, amongst the wind, freezing waters and hundreds of wild animals was unexpected and awe-inspiring. 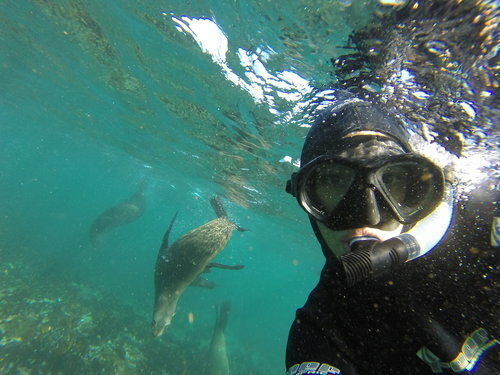 Plus, seals are ridiculously cute and playful underwater. It’s an experience that we fully raccomend. Cape fur seals are found as far north as the southern tip of Angola, with colonies occurring all along the coastlines of Namibia and South Africa, up to Algoa Bay near Port Elizabeth. The Cape fur seal is the only seal species that breed in South Africa, however, there are other species such as Elephant Seals (the gigantic seal mentioned above), Subantarctic Fur Seals, Leopard Seals that occasionally pass by our coastline. A male seal is called a ‘bull’, a female seal is called a ‘cow’. Males have a large chest, a thick mane; the females are smaller and have a silver-grey fur. Newborn pups are velvet black but after their first molt (shedding of skin and hair) at 3-5 months of age, they change to an olive-grey colour. After a year their coat turns silver-grey. Cape fur seals feed on shoaling fish, squid, octopus, sharks and rays. They can dive to depths of over 200 meters and hold their breath for up to 7.5minutes. They are very active and social in the water and territorial on land. Their main predator is the Great White Shark – although, by Duiker Island (Seal Island) Great White spottings have been extremely rare (as sharks don’t like kelp). Seals are also hunted by brown hyenas and black-backed jackals on land. They are generally curious, playful and relaxed animals, and a pleasure to snorkel with. To book a kayaking or seal snorkeling trip check out their website – https://www.capetownbucketlist.co.za/.